Traditional methods of countertop fabrication are being replaced by many forward-thinking shops using digital fabrication tools. Traditional methods are a great solution to replacing your countertops and the techniques are well honed and produce a beautiful result. But digital templating also produces a superior result in less time and more conveniently. But what exactly is digital templating? Digital templating uses a machine that contains a laser. The machine itself sits atop a tripod where it can get a 360• view of the room in question. The laser scans the area, mapping out every nook and cranny and irregularity in your kitchen or bath. It precisely measures around columns, doorways, sinks and all other details of the room. Immediately after the scan has been completed, the machine can give you a same-day on site view of what the new space will look like. 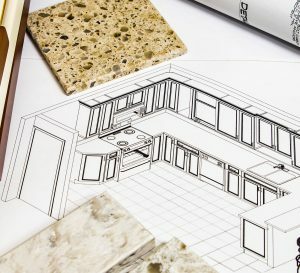 Your contractor can then walk you through options such as granite thickness, edge finishes, corner angles, overhangs and other options to help you design the kitchen of your dreams. The laser basically creates a framework that you and your contractor can build on. Right from your home site, he can email the plans to himself or a milling shop so there is no time wasted in waiting. The digital files can now utilized by a CAD machine to cut a precise vinyl template that can be transferred to the granite for cutting. The countertop will be cut, prepared and finished before bringing to your home – no need for repeated in home trial and error fittings and adjustments. Removing the existing countertop and installing your new granite can all be done in just one day, with no need to have the old one removed for measuring and fittings. When you are looking for a contractor specializing in countertop fabrication, ask whether they use the digital templating system to measure your space. With the added accuracy, versatility and convenience, digital is the way to go.